KNOXVILLE, Tenn. – In front of a sold out Thompson-Boling Arena crowd, No. 3 Tennessee dominated its Southeastern Conference opener from the opening whistle, blitzing Georgia in a 96-50 win. Led by a combined 56 points from Jordan Bowden (20), Grant Williams (18) and Admiral Schofield (18), Tennessee (12-1, 1-0 SEC) led Georgia (8-5, 0-1 SEC) by as many as 49 points en route to a 46-point victory Saturday afternoon. The 46-point scoring margin tied the second largest margin of victory over an SEC opponent in Tennessee program history. Through nine games inside of Thompson-Boling Arena this season, the Vols have outscored their opponents by an average of 25.9 points, as Saturday was the largest margin of victory this season. Kyle Alexander finished with a career-high 14 rebounds as he notched his second double-double of the season, finishing with 12 points in the game. Alexander grabbed eight rebounds in the first half to pace him to his new career high. It was the second time this season he had double-digit rebounds in a game. After taking a 29-point lead into halftime, Tennessee continued to build on its lead, as a Williams 3-pointer from the left wing pushed the lead over the 30-point barrier. 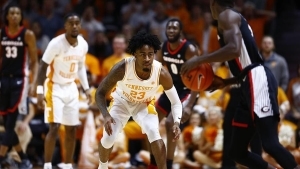 The Vols continued to clamp down defensively as they limited the Bulldogs to just 30.8 percent shooting in the second half and allowing just one 3-pointer on 12 attempts. Georgia finished 1-of-20 in the game from beyond the arc. Tennessee was able to get to rim in the second half, as 10 of its 17 made buckets were layups, with five of those coming on fast breaks. Williams proved tough to handle from the jump. The junior forward got to the free-throw line on the opening two possessions. Williams then worked his post game to extend the lead to 9-4 at the 16:31 mark after a knocking down a fadeaway over two Georgia defenders. Williams was fouled eight times in the first half, attempting 11 free throws in total. The Charlotte, North Carolina, native converted nine of his attempts, leading the team with 15 points in the first half. Schofield picked up the scoring from there, scoring the next eight points for the Vols, including converting an and-one layup off a pass from Williams. A Schofield three from the right wing at the 12:02 mark in the half helped spark an 18-2 Vols run over the next 5:00 to extend the lead to 32-14. Schofield finished with 13 points in the first half, knocking down both of his 3-point attempts. Bowden joined Williams and Schofield in double figures, converting on 5-of-7 attempts from the field in the first half. Bowden punctuated his 13-point first half with a run-out slam to extend the lead to 23 with just under two minutes to play in the first. SHOOTER’S RIM: Over the course of its past five games — contests against Memphis, Samford, Wake Forest, Tennessee Tech and Georgia — Tennessee shot a combined 163-for-291 (56 percent) from the field. The Vols have eclipsed 50-percent shooting during each of those five wins. DIMES FOR DAYS: Tennessee registered 25 assists in the win over Georgia, the 10th game of 20 or more assists for the Vols this season. All 10 UT players who notched more than two minutes of court time had an assist in the game, with Jordan Bone and Williams tying for the team-high with five a piece. Among SEC teams, no other team has more than five games of that variety, while no other team ranked in this week’s AP Top 25 has done it more than seven times. CHARITY STRIPE: Tennessee converted 22-of-26 free-throw attempts in the game, as the Vols helped build their first half lead from the charity stripe. They knocked down 15-of-18 tries in the first half, as Georgia fouled Tennessee 13 times–including eight drawn by Grant Williams. LIMITING THE BULLDOGS: Entering Saturday’s game against Tennessee, Georgia ranked second in the country in defensive rebounding (32.0 rapg), fourth in blocks per game (6.3 bpg) and seventh in total rebounds per game (43.2 rpg). The Vols held Georgia to just 21 defense rebounds, two blocks and 30 total rebounds. The Bulldogs had also scored at least 80 points in six games and were limited to just 50 on Saturday. Georgia’s Nicolas Claxton came into Saturday’s contest as the reigning SEC Player of the Week. The Vols were able to get the 6-11 sophomore in early foul trouble; by the 4:01 mark in the first half, Claxton had picked up his fourth foul of the game. Claxton, who came in to the game ranked eighth in the nation in blocks and 15th in rebounding (10.2 rpg), finished the day with just six points and five rebounds in 24 minutes of play. Bulldog’s leading scorer, Rayshaun Hammonds, finished with zero points in the game after coming in averaging 15.0 points per game. The sophomore forward was also limited to one rebound in the game after coming in averaging 6.9 per game. UP NEXT: The Vols travel to Columbia, Missouri, on Tuesday for their first road contest in SEC play. 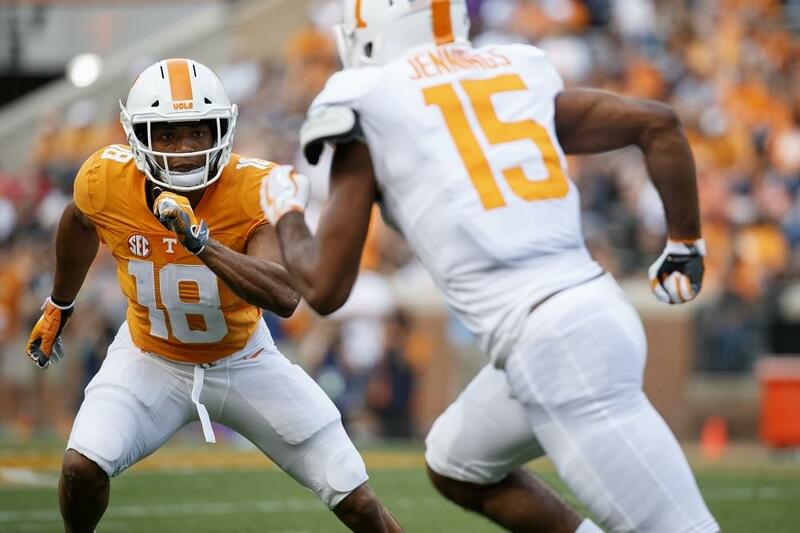 Tennessee will square off with Missouri at 7 p.m. ET, with the game airing on ESPN2.